How do you engage your customer base?. How do you maintain their interest in your company?. How do you share and improve your value proposition?. In the business world we use to balanced all our efforts to get the right answers to these strategy questions. Sun Trust an Atlanta USA bank with 1.623 branches, that offer a full rank of financial services portfolio, has found the right way to do it, chosen social network as a tool for engaging their customers and helping them to improve the quality of their life. Their strategy called "Live Solid" constitutes the centre of his customer value proposition above been a bank. He has built a an own network http://www.livesolid.com which promote between their customers with the main idea that "concentrating your efforts in what is really important in your life, you can be freer" . He suggests three main areas to work in to get that freedom : Financial in order, Priority straight and Life in focus. On their proprietary network http://www.livesolid.com/en-US/index.jspx, they share advices on how to reach this three above target to the different aspect of our daily life: My well being, My money, My relationship, My retirement, My futures plans, My children. In each of this cateories you will find, tips and videos of how save money doing things in a new manner. They also encourage their members to focus on daily small saving "Dollar Wise" where you can set up small saving targets, and chose what actions are you going to deploy to get it. (i.e. shop with a calculator, inflate your tires, etc). With that app on Facebook you can outlook you daily, monthly and year saving, you want to reach if you fulfil the actions you have committed to. This very creative approach has a very powerful value proposition on their own, that transform a pure financial institution into a partner helping their customers to manage their finance and taking the felling that you have a company that you can count with. 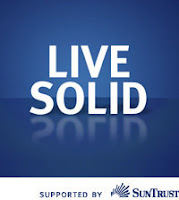 Live solid, is a great example of how to integrate social Media within the company strategy as an additional channel and at the same time following our customer communications preferences, what allow us to build that invisible link with our customers that everyone of us would love to have.